Aluminum Cab Racks Styles Availible in: Amplimesh With Diamond Plate and Window, Louver Window and Diamond Plate, Round Heptagonal Tube Window and Diamond Plate and Open Hoop and Diamond Plate Cab Racks. 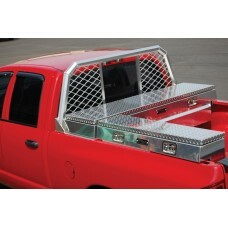 Optional Accessories Availible Such as Lights, Antenna, Flag, Oversize Load Sign Brackets to Name A Few. Aluminum and Steel Pick-up Tool Boxes, Styles Availible are: Aluminum Dual & Single Lid Cross Body Tool Boxes, In Bed Chest Style Box, Drop Door Side Rail Boxes, Top Open Contractor Boxes, Wheel Well Boxes and Top Opening Tongue Boxes. Also, Availible: Pickup Truck / Rancher Body Aluminum Flatbed (84” X 102” & 96” X 102”) With Stake Pockets, LED Lights, Gooseneck Trailer Hitch Trapdoor Access, And Cab Rack Headboard. Please Contact Zamzow Customer Service for Custom Size for Any Application. They Offer Aluminum Cab Racks Styles Availible in: Amplimesh With Diamond Plate and Window, Louver W..